If you reside in the state of New Jersey, you are going to be spoilt for choice as there are many blackjack variations available including live blackjack at all of the legal online casinos in New Jersey. We’ve narrowed the selection down to 3 sites we recommend that provide the best overall experience if you are looking to play blackjack online. One of the most popular online casinos in New Jersey, Golden Nugget offers a nice $20 no deposit bonus for newcomers when using the code PLAY20. Their popularity stems largely from the ability to provide vast diversity in gaming options as they use multiple software providers to power their catalog which includes Ezugi, NYX, IGT, Slingo and NetEnt. Golden Nugget has a very diverse catalog of online blackjack tables and has the most amount of variations available by far compared to its’ competitors. One of, if not the largest online casino brand, 888 has established itself as a prominent leader in the industry for over 2 decades and has a presence in New Jersey, Delaware and Nevada. They have a nice $20 no deposit bonus for newcomers and while they don’t have as an extensive a catalog of online blackjack options as Golden Nugget, their live blackjack dealers are superb. 888 are currently the only ones in New Jersey powered by Evolution Gaming which are the leading standard when it comes to live blackjack. Operating since 1997 (under the original name Starluck Casino), Party Casino is an industry leader and opened business to NJ residents in March 2018. They have a decent cashback scheme for loyal members although it is only 0.05% for playing Blackjack. They currently have a 100% up to $500 welcome bonus for newcomers who use the code WELCOMEBONUS. How Did We Select Our Recommendations? If you reside in New Jersey, make sure that you play at an online casino that has been legally sanctioned and licensed by the Division of Gaming Enforcement (DGE). There many online casinos that are not officially licensed and are flat out scams looking to pilfer your money and identity. Only sites that are on DGE’s official list have been licensed to provide online blackjack and any site that is NOT listed should be avoided immediately. We ensure that any New Jersey casino listed on BJI is licensed and approved to legally allow for online blackjack. The biggest advantage Golden Nugget, 888 and Party Casino has over others is that they have live blackjack options available whereas many other New Jersey based casinos are unable to provide this as of yet. Golden Nugget, in particular, has the biggest diversity in regular online blackjack variations (as tabled above) which is why they are listed first. What makes 888 and Party Casino strong contenders is their utilization of Evolution Gaming software which allows for the best live blackjack experience available. For newcomers, Golden Nugget and 888 certainly offer the best promotions available since they both offer a $20 no deposit bonus. This allows for you to test out their online blackjack games for free without having to risk any of your own money. Party Casino’s welcome bonus isn’t as impressive however they do have a decent cashback system for loyal players which rewards you everytime you place a bet. One thing that has perhaps caught some people off guard is the amount of details required in order to play. New Jersey online casinos are required by regulation to do it’s best to verify the identity of it’s customers in order to protect themselves from any potential money laundering schemes. With that in mind, it’s fairly common for NJ casinos to ask for details that would include your name, address, date of birth and social security number. Absolutely not. All games at licensed online casinos in New Jersey are monitored and audited by the Division of Gaming Enforcement to ensure that the casino isn’t cheating it’s customers. The sites we have listed here also have a long history of being highly reputable and have been servicing customers for many years without issue. 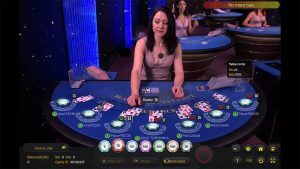 If you really want to assure fairness, then the best option is to play live dealer variations where you can visibly see each action the dealer physically makes as he handles the cards. Can I play from my mobile? Yes. The sites we have recommened on this page are all mobile compatible and work on both iOS and Android devices. This includes the live blackjack dealers! What is the best strategy for playing blackjack online? Refer to our blackjack engine for charts on how to play basic optimal strategy. While card counting is an effective method of gaining an advantage at land-based casinos (you can learn how to card count here), unfortunately the cards are shuffled far too frequently making it impossible to get an accurate count. What other states allow for legal online gambling? While New Jersey has been at the forefront of legalizing online gambling, Delaware and Nevada have followed suit and as the legal landscape in the US has been changing recently it’s becoming clear that other states are slowly opening up to the prospect of allowing online gambling. For more information, read our article on US laws here. What is the age restriction to play? All patrons are required to be of at least 21 years of age. Can I play from outside of New Jersey? No. You must be physically within New Jersey if you intend to play although it is allowed to register an account whilst outside of NJ.